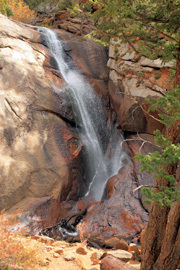 Elk Falls is located 5.18 miles from the Ranch Hand picnic area in Staunton State Park. This 75-foot fall pours over granite cliffs into North Elk Creek with good views of the Lion’s Head formation. Most of Staunton State Park lies over the Pikes Peak batholiths, a granite formation which intruded overlying Precambrian metamorphic rock layers. Subsequent cycles of uplift and differential erosion exposed the granite and eroded most of the Precambrian rock, creating the striking granite cliffs and outcrops we see today. The Staunton Ranch Trail winds through a mixed conifer-aspen forest to a gravel road (.48 miles : 8,471’), and continues straight toward steep granite cliffs with several spurs for climbing access. It climbs steadily through a large aspen grove with emerging views of the Lion’s Head (.5 miles : 8,481’). Keep straight past the Chase Meadow Trail (.95 miles : 8,582’), where the landscape opens with expansive views of cliffs to the north. Travel steadies to an unnamed road; turn right to remain on the Staunton Ranch Trail (1.75 miles : 8,611’), which becomes rockier up to the Old Mill Trail split. Keep left on Staunton Ranch and pass climbing access spurs at 2.0 and 2.5 miles. Look for climbers as you pass under rocky outcrops. Stay straight through a grassy valley to another unnamed gravel road (2.85 miles : 8,875’). Turn right on the road through a large aspen stand to a junction with the Bugling Elk, Marmot Passage and Borderline trails (3.14 miles : 8,972’). Continue straight on the Bugling Elk Trail, a wide road that climbs through dense timber before titling down into a wide valley. It crosses the valley, re-enters the forest and continues downhill beside a small stream to Elk Falls Pond and the Lions Back Trail split (4.19 miles : 8,890’). Merge onto the Lions Back Trail, which skirts the north shore and climbs to the Chimney Rock Trail (4.32 miles : 8,879’). Turn left onto Chimney Rock, where an old cabin soon comes into view. The trail winds through a dense pine forest before opening to a large boulder field (4.6 miles : 8,906’). Here the trail is cut into the edge with views across a deep canyon. Travel levels on a duff-covered path against mossy cliff walls to the Elk Falls Trail (4.95 miles : 8,884), where mountain bikers will have to dismount. Head left down the rocky, hiker-only Elk Falls Trail with good views of adjacent cliffs and rock formations. The trail descends chain-aided rock stairs, then switchbacks steeply to views of Elk Falls (5.18 miles : 8,616’). Multiple rock ledges provide great views of the falls, and of the 9,450' Lion’s Head rock formation to the southwest. Click here to see a live webcam of Staunton State Park! Tread carefully on chain-aided rock steps on the descent to Elk Falls, especially when covered by snow. There is no backcountry camping at Staunton State Park. Fishing is permitted at Elk Falls Pond with a valid Colorado fishing license. There's a $7 entrance fee to Staunton State Park. Colorado State Parks passes are accepted. Park Hours: 8 a.m. - 5 p.m. Dogs are permitted at Staunton State Park, but must be on a six-foot leash. Rock climbing is allowed. Climb without bolting or fixed protection only. Seasonal raptor closures are clearly posted and strictly enforced. Mountain biking is allowed on multi-use trails. Staunton State Park is located 40 miles SW of downtown Denver in Pine, CO. The park is approximately 6 miles west of Conifer on the north side of US Highway 285. From the junction of US 285 and C470 near Denver, travel 18.4 miles on 285 South towards Fairplay. Turn right (north) on Elk Creek Road. Travel on Elk Creek Road for 1.2 miles, then turn right into the park. The Ranch Hand picnic shelter and trailhead is .5 miles from this entrance.